As the attention of Americans is diverted by inconsequential TV shows like “American Idol,” “Jon and Kate Plus 8 Divorce Lawyers” and cheerleading competitions (NBC, CBS and ABC “news” for the Obama administration), we pay less attention to what is happening to our country. We are all mindlessly watching speculation by the “news” shows on the Michael Jackson toxicology report while Congress is up to its old tricks of making stupid laws. Like a bunch of gangstas, our “leaders” are going to “cap our gas” with the cap and trade bill, which is just another tax on business that will make us even less competitive in the world. And while a 1,000-page bill with a one-day imperative to pass it was being rammed through the House, 300 pages worth of pork amendments were inserted in the wee hours of the night in order to buy certain congressmen’s votes (a catfish museum is coming soon to a congressional district near you). Apparently, Congress is breathlessly trying to save the environment in one day. 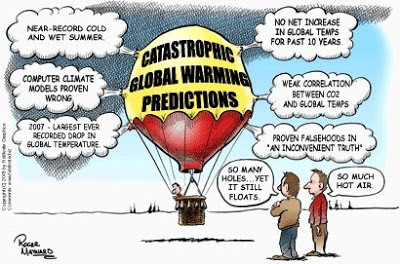 The reality is that folks are catching on to the fact that man-made global warming is a hoax, an inconvenient truth attested to by more and more scientists. Like any good con man, Obama wants to hurry the shakedown before his mark figures out his game. Democrats actually said that “if we do not act now, the climate will soon be out of our control.” This, of course, raises the question: Just when was the climate ever under our control? Leave it to Obama to think he can control the weather. While cap and trade is clearly being pushed by Nanny Pelosi and Obama, he has not really talked much on the subject for fear it might fail. In fairness, Obama seems increasingly uncomfortable talking about anything but himself. After passing the House, the bill goes to the Senate, where a compromise might be struck. Instead of making companies pay the government for the privilege of conducting their business, perhaps Congress will take a page from the extortion/protection racket practiced by the Mafia for years and will just let the businesses write their checks directly to the Democratic National Committee. Obviously, the big winner here is any business not located in the United States. Obama’s policies of empowering unions, making it easy for plaintiffs’ attorneys to sue, increasing regulation and raising taxes will chase more companies out of the United States to business-friendly countries overseas. It is no accident that more of the big IPOs of companies are now taking place on foreign exchanges. The myth of man-made global warming was started by the left, fanned by Democratic outcast Al Gore with his “The Sky Is Falling/Chicken-Little” slide show, and perpetuated by attacking anyone who dared to question his dubious science. That is pretty much the MO of the left: Begin with a self-righteous premise, repeat it often enough, say things like “The science is conclusive on this,” and then personally attack anyone who disagrees. If Gore cares that much about the earth’s temperature, he could just walk around providing shade for cities. We have been lulled to sleep by the media’s frivolous entertainment. Our newspapers are slowly dying because they have become cheerleaders and not independent purveyors of the truth, allowing our politicians to get away with egregious conduct and the waste of our national resources. Obama said that “global warming is happening much quicker than we thought.” Then one of his handlers reminded him that it is now summer. Undaunted by the dismal success rate of past scientists’ predictions (Y2K doomsday threats, the hole in the ozone layer scare, the dangers of nuclear power), the Democrats lumber forward. In fact, what was the last dire prediction of leftist scientists that actually came true? If you think of any, let me know. Meanwhile, e-mail your senator and stop this bill while we still can. There are some positives to CNP. The trade side of Cap-and-trade, offers a chance to make money trading derivatives and options. Unfortunately, this will not offset my increased utility and gasoline costs.